How do I get tickets to a Yerba Buena Gardens Festival program? There is no designated seating, no ticket system, no required RSVP list. Yerba Buena Gardens Festival venues are outdoors. The majority of seating is open lawn. Patrons may sit wherever they wish. If venue chairs are available, please give priority to persons with disabilities and seniors. Blankets and low lawn chairs are encouraged. Please leave pets at home. The outdoor programs presented by Yerba Buena Gardens Festival are admission-free thanks to our sponsors and supporters like you. What time are the shows at Yerba Buena Gardens Festival? Our regular season runs from May through October. Most events and presentations occur at lunchtime or on the weekends. Please see our Calendar for specific dates and times. Will my wheelchair be a problem? Are there chairs? All Yerba Buena Gardens venues are fully ADA accessible. Limited chairs are available on a first-come, first-served basis. Each senior or disabled patron may be accompanied by one other person. All unoccupied seats become available for general seating. Wheelchairs are accommodated. Please see a Festival staff member for assistance. Where is Yerba Buena Gardens? Which BART, bus or train do I take to Yerba Buena Gardens? BART/MUNI stations for Powell and Montgomery are both 2 blocks away from Yerba Buena Gardens. MUNI Bus lines 8X/8AX/8BX San Bruno, 14 Mission, 30 Stockton, 45 Union/ Stockton run past Yerba Buena Gardens. All Market St. routes, including Powell and Montgomery stations, are 2 blocks away. The CalTrain Station at Fourth and Townsend Sts. is served directly by MUNI’s 30 Stockton, with stops on Third St. at Howard St. and at Mission St. Yerba Buena Gardens Festival is also convenient to Golden Gate Transit, SamTrans and AC Transit downtown bus routes. What is the best way to get to Yerba Buena Gardens by driving? Take I-80 and exit at Fremont St. Take an immediate left from Fremont onto Howard St. and get into the right lane. Go two blocks and turn right on Third St. Yerba Buena Gardens will be immediately on your left across from the SFMOMA. 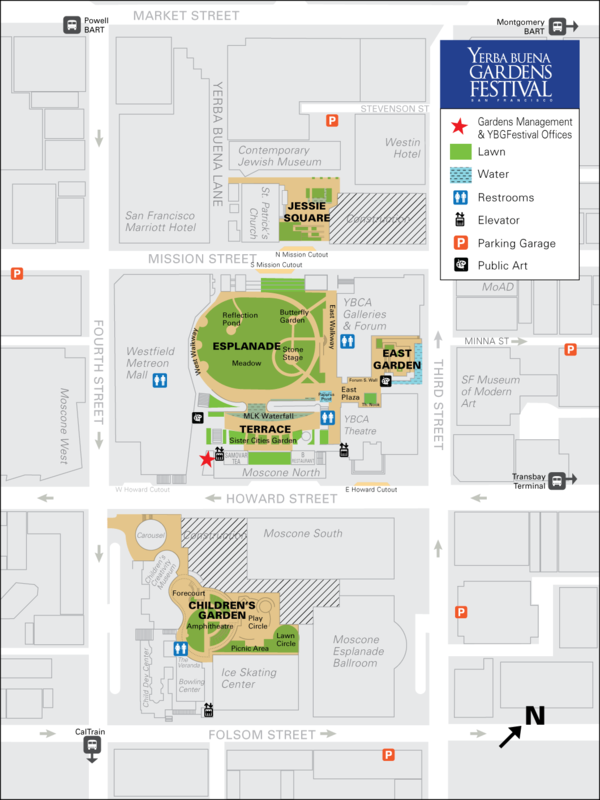 Take Highway 101 until it connects to I-80 and exit at Fourth St. Fourth will lead onto Bryant St. Take a left from Bryant onto Third St. Yerba Buena Gardens will be on your left between Howard and Mission Sts. and across from the SF Museum of Modern Art. Take Highway 101 to Lombard St. From Lombard turn right onto Van Ness Ave. From Van Ness Ave. turn left onto Golden Gate Ave. Golden Gate becomes Sixth St. as it crosses Market St. Turn left from Sixth St. onto Folsom St. Turn left onto Third St. Yerba Buena Gardens will be on your left between Howard and Mission Sts. and across from the SFMoMA. Is there parking around Yerba Buena Gardens? I lost stuff at Yerba Buena Gardens. Is there a Lost & Found? Lost & Found is located at the Yerba Buena Gardens Management office. Drop in (see ★ on Gardens map) or call (415) 820-3550. Is there food at Yerba Buena Gardens Festival? Can I bring my camera to Yerba Buena Gardens Festival? Professional photography or recording of performances is not permitted. Film or photo shoots in Yerba Buena Gardens require an event permit and may incur fees. What else is there to do at Yerba Buena Gardens? What am I allowed to bring to Yerba Buena Gardens Festival?